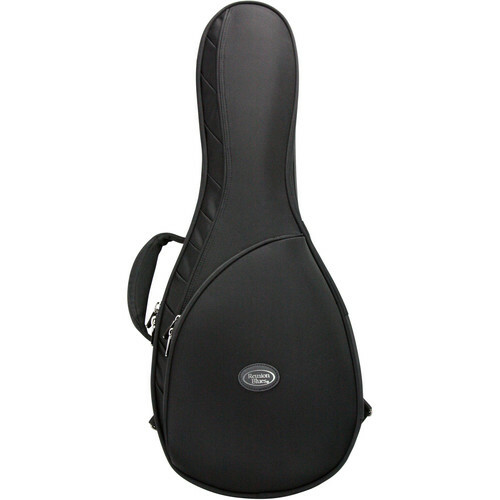 The RB Continental Midnight Series Mandolin Case from Reunion Bags is designed to protect and transport your mandolin. This case features a Ballistic Quadraweave exterior and a quilted "double helix" velvet interior. It also has high-strength corded edges and seams, is double-stitched with high tensile thread, and is reinforced at tested stress points. This mandolin case has a thick shock-absorbing Flexoskeleton with reinforced impact panels, a neck brace suspension system with an adjustable locking security strap, and rubberized foam headstock grip. The adjustable padded hideaway backpack straps are designed for easy transportation. Each case is reinforced at tested stress points and double stitched with extra-strength high tensile thread. A knurled abrasion grid on the bottom resists scuffing. The case is finished with custom plated hardware, including industrial strength zippers and a Zero-G palm-contoured handle with weight distributing foam core for increased longevity. Box Dimensions (LxWxH) 31.5 x 15.0 x 8.0"